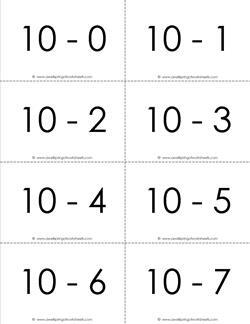 This 2 page set of black and white subtraction flash cards covers the 0's for subtraction facts between 0 and 10. Great practice for beginners! 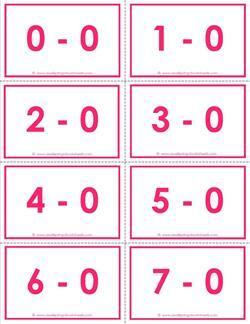 Introducing ... subtraction flash cards for 0's in a stunning pink. These 2 pages of 11 flash cards have subtraction facts for 0 to 10. 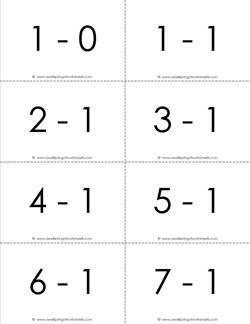 This simple black & white set of 11 subtraction flash cards has every problem for subtracting 1 and subtracting from 1 for the numbers 0 to 10. 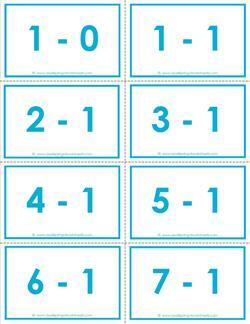 These pretty blue subtraction flash cards are just for the 1's and include numbers between 0 and 10. Created for first graders to learn fluently. 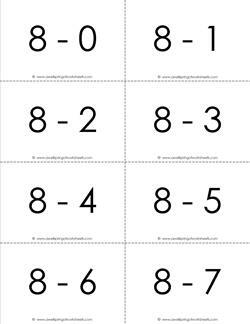 Okay, so here's the low down ... these black & white subtraction flash cards for the 2's for numbers 0-10, if practiced, will make you really smart! 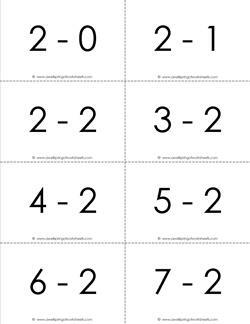 Now, if you use these green subtraction flash cards for the 2's, you will become even smarter than if you just used the black & white version! Just kidding! 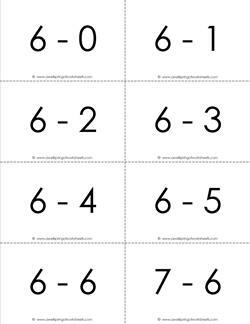 Since first graders should know their subtraction facts for 0 to 10 fluently, why not use this set of subtraction flash cards to help you get there? 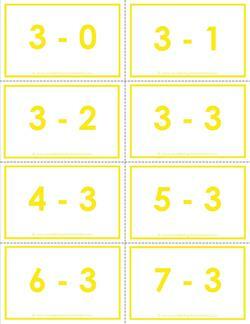 Progressing through the colors of the rainbow, these subtraction flash cards for the 3's happened to fall on yellow. Includes facts for 0 to 10. 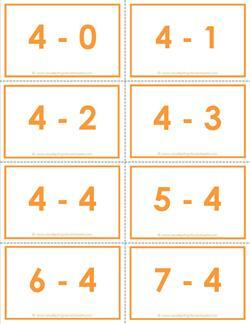 This soft orange color is a perfect fit for subtraction flash cards for the 4's. Why? I don't know, it just sounded good! Includes facts for 0 to 10. Here's a set of black & white subtraction flash cards for the fantastic 5's. 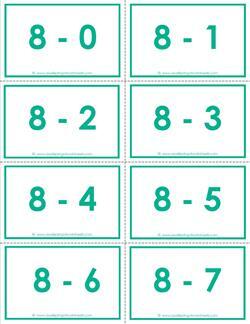 Includes 11 cards for subtracting from 5 and subtracting 5 for numbers 0-10. 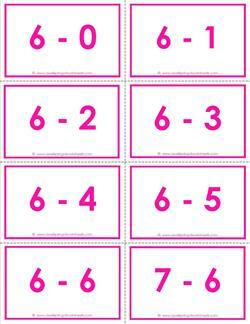 I know you're just dying to print and use these pretty salmon colored subtraction flash cards for the 5s'. Includes numbers 0-10 for first grade. 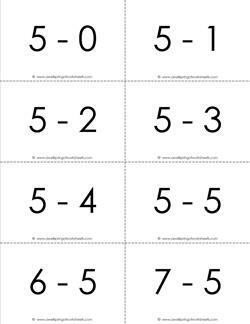 These subtraction flash cards for the 6's are here to help you with those foundational and necessary subtraction facts for numbers 0 through 10. 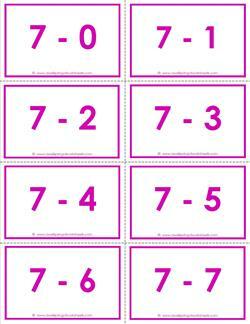 These schnazzy bright pink subtraction flash cards for the 6's have 8 cards per page. Just right for little first grade hands. Facts for 0-10 included. 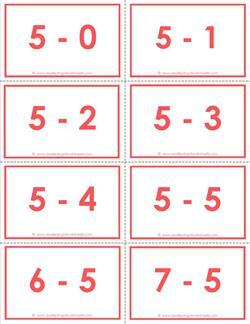 Have a blast blasting through these subtraction flash cards for the 7's. Start from 0 and fly all the way through to 10. You can do it. I have faith in you! Lovely lilac for the lovely 7's. 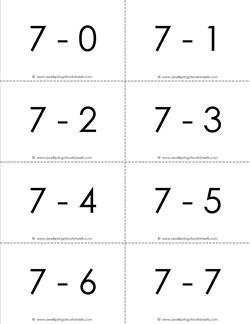 Please enjoy using these 11 subtraction flash cards for the 7's. Includes numbers 0 -10 to build a solid foundation of facts. Gone with the Wind is a classic love story. 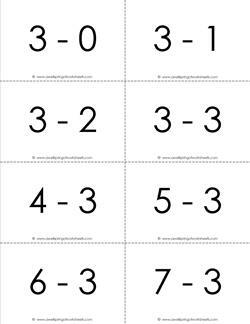 Learn these basic 0-10 subtraction facts for 8's & you'll be gone with the wind & on to more math facts you love! Learning subtraction facts never gets boring. 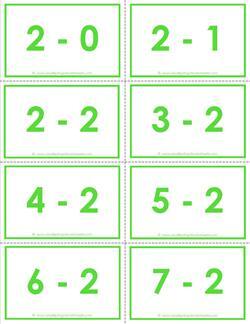 Especially when there's a sticker or some other treat for learning facts like these green 0-10 facts for the 8's. No more of this "I think I can, I think I can" stuff. 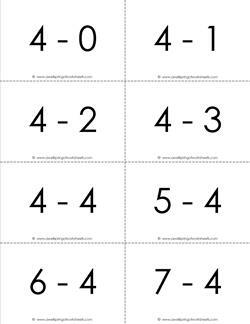 I know you can memorize these subtraction facts for 9's for numbers 0-10. Think positively. Push yourself! 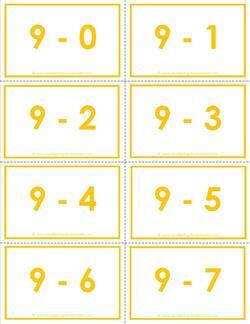 These 11 subtraction flash cards for the 9's are a peachy keen peachy color. Don't get stuck in the pits! Keep taking a bite out of these facts until you're done. Memorizing subtraction facts from 0-10 may seem like a giant task, but there is no giant you can't conquer! 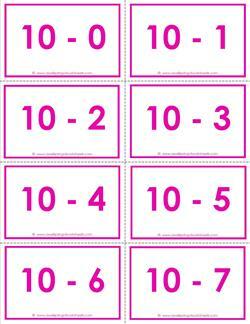 Use these subtraction flash cards for the 10's as a tool. Learning how to subtract from ten in the ones place is a great foundation for subtracting in the tens & hundreds places, too. Learn these facts well! 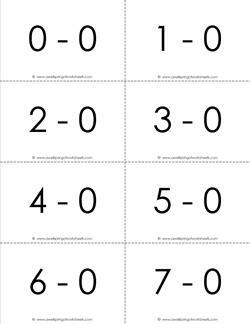 These subtraction flash cards come in black and white and include all the facts for the numbers 0-10. There are 66 cards on 9 pages. 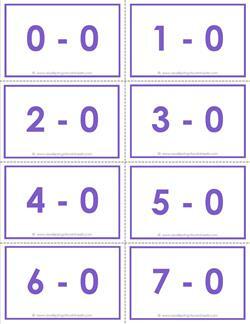 This set of subtraction flash cards come in purple and include all the facts for the numbers 0-10. There are 66 cards on 9 pages.